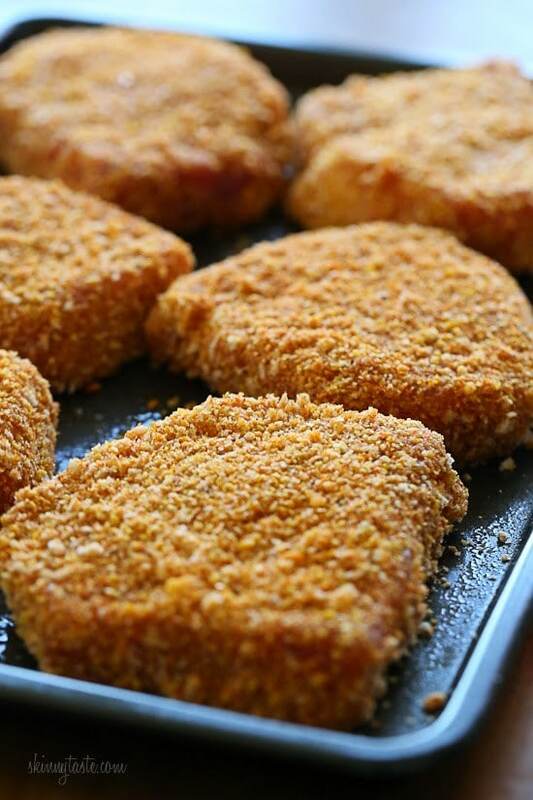 Juicy, delicious, oven baked, boneless pork chops coated with a seasoned crisp crust. Ready in under 30 minutes, easy and kid-friendly! These pork chops are amazing and better than Shake-n-Bake. Even my husband (who’s not a big pork chop fan) LOVES them. I served it with a raw shredded brussels sprout salad. 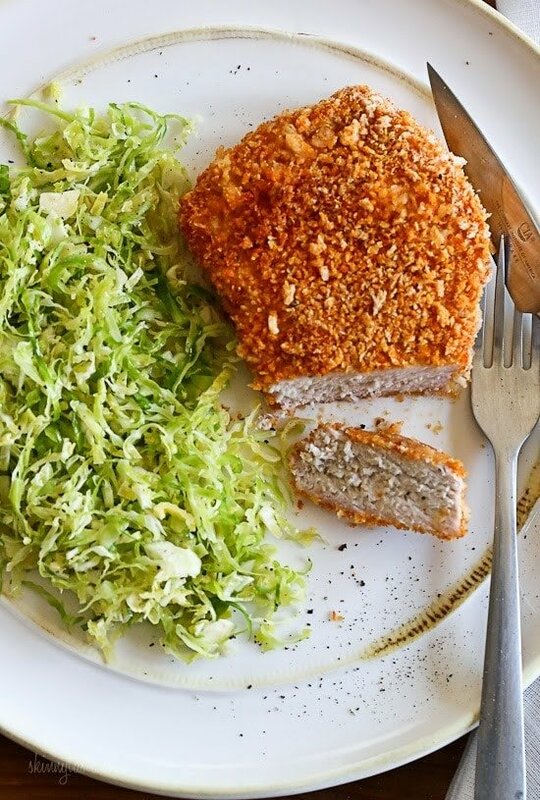 I also have an Air Fryer Breaded Pork Chop version here. When I was a kid, my Mom’s friend Debbie often had my brother and I over for dinner because, well she lived right upstairs from us. We loved this, and she was so good to us. She would make broccoli, Rice-a-Roni and Shake-n-Bake pork chops. Growing up in a home where my mom made everything from scratch, this was totally new to us and we loved it. As an adult, I know how processed (yes still yummy) those things are so I make them myself. One day I’ll share my healthier Rice-A-Roni recipe, it’s easy! 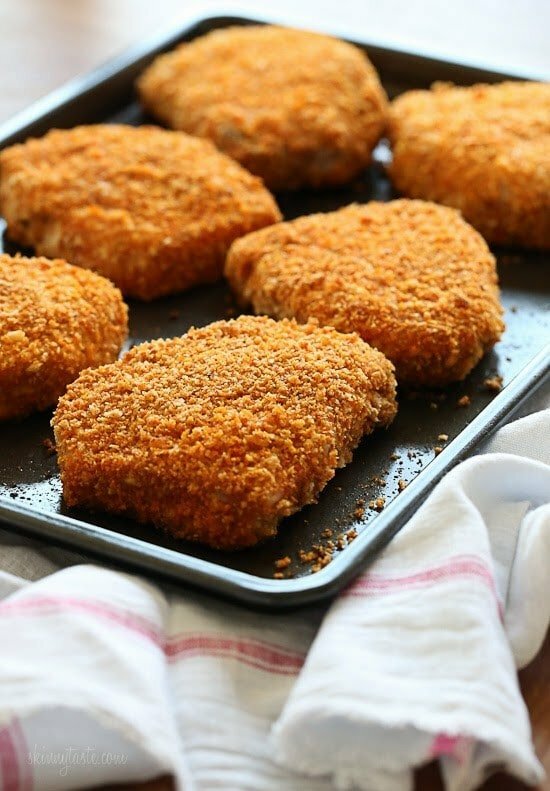 Juicy, delicious, boneless pork chops coated with a seasoned crisp crust. Ready in under 30 minutes, easy and kid-friendly! Preheat oven to 425°F. Spray a large nonstick baking sheet lightly with oil. Season pork chops on both sides with 1/2 tsp kosher salt. 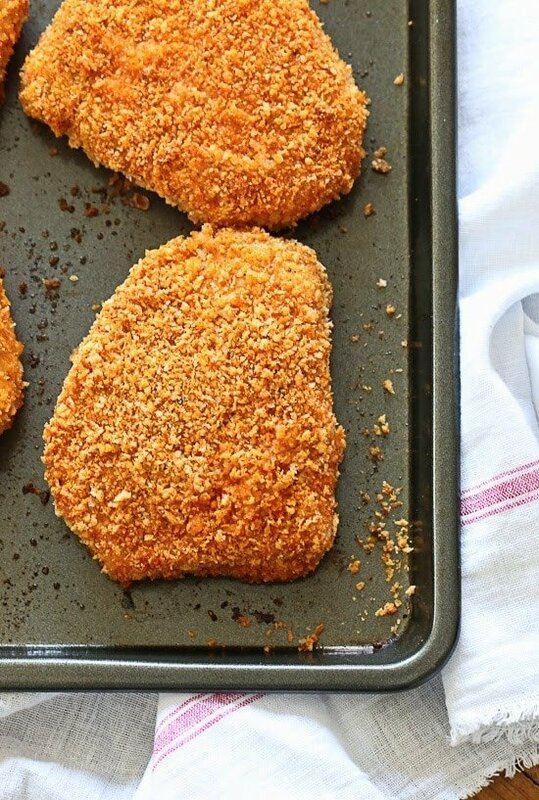 Combine panko, cornflake crumbs, parmesan cheese, 3/4 tsp kosher salt, paprika, garlic powder, onion powder, chili powder and black pepper in a large shallow bowl. Place the beaten egg in another. Dip the pork into the egg, then crumb mixture. Place on the prepared baking sheet and repeat with the remaining chops. Lightly spray a little more oil on top of the pork and bake in the oven for 20 minutes. Did you ever share your healthy Rice A Roni recipe? Looks like a lot of requests for it here, but I searched and couldn’t find it. 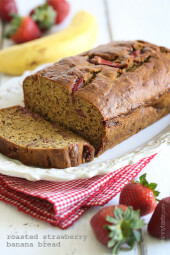 It was definitely a favorite of mine when I was a kid and would love to recreate a healthier version! I didn’t have spray oil. In a different version of oven fried chops, the directions said to just melt butter in the cooking pan, so I put my pan in the oven while I breaded the chops, but alas, the butter at 425 browned in no time! I should have figured that one out! 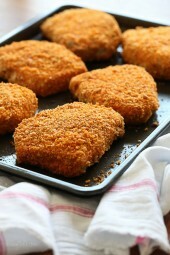 I plunked the first breaded chop into it and went on to the second. The third chop was placed on the pan without butter or oil, but i did put a very tiny dab of butter on top the chop. Also, I did not use any cornflake crumbs or cheese. (I had made a cornflake/parm encrusted chop previously and hated it, so I put all the cooked chops in the fridge and gave them to the dog over the course of a week–they did not have salt or other seasonings so were safe for him.). I will be buying spray oil and try this one to the letter next time! Great recipe! 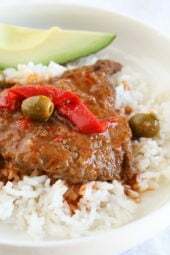 I had to double it for my family but it was great with asparagus and fried potatoes! Thank you! 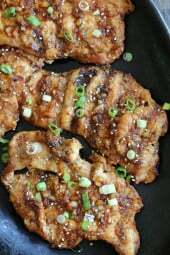 I have thick boneless pork chops. How long do I bake them for? Would I need to turn them over half way? Yes same as recipe directions. If they are thicker than 3/4 inch, cook for another 3-7 or so minutes until they are ready.